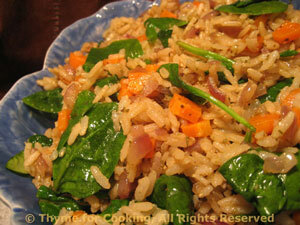 Savory Brown Rice and Spinach Pilaf, easy, Thyme for Cooking summer sides. This rice is cooked in beef stock, just to vary the flavor a bit. Substitute Basmati. Cook rice, marjoram, in beef stock according to package directions. Roughly chop the carrot and onion. Heat oil in a medium skillet. Add carrot and onion, sauté until tender. Pick through spinach, discarding any damaged leaves. Wash and drain well. Slice any very large leaves. When rice is done, add it to the skillet, along with the spinach and soy sauce. Cook, stirring, just until the spinach starts to wilt. Serve.